At Allen Business Machines, we have a wide variety of printing equipment to help you increase your productivity. However, we know that hardware is only one part of the equation. The best devices in the world won’t help you if employees don’t use them effectively. If left unchecked, inefficient or wasteful printing practices can create problems for your workplace. Not only can they increase your supply and operating costs, they can put a strain on your equipment. This can lead to service calls, lost productivity and even more expenses. 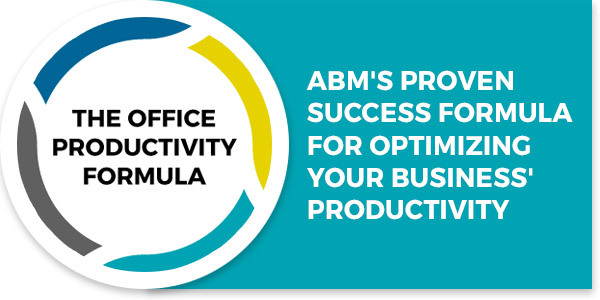 ABM’s Managed Print Services allow clients to get their printing processes and costs under control. We can help you track usage and promote greater accountability throughout your workplace. We’ll come to your office and do a thorough assessment of your printing practices. We can then use that info to fine-tune how you print. We can collect and analyze data from your devices remotely. You can take care of your daily tasks while we focus on refining your workflows. You can arrange to have printing supplies sent to you as soon as your levels drop to a certain point.